Press Release (ePRNews.com) - SANTA ROSA, Calif. - Mar 06, 2019 - Charles M. Schulz — Sonoma County Airport (STS) is excited to celebrate United Airlines’ daily nonstop service to and from Denver, Colorado. The inaugural Denver flight is scheduled to land at STS at 11:57 a.m., and depart STS at 12:30 p.m. beginning Friday, March 8. Celebratory signage, flowers and balloons will be placed throughout the Airport, and Denver passengers will be presented with Wine Country goody bags. The United Airlines service from Charles M. Schulz – Sonoma County Airport (STS) to Denver International Airport (DEN) has been in the works for several years. Expansion of air service to/from Wine Country is a strategic move for both United and STS. 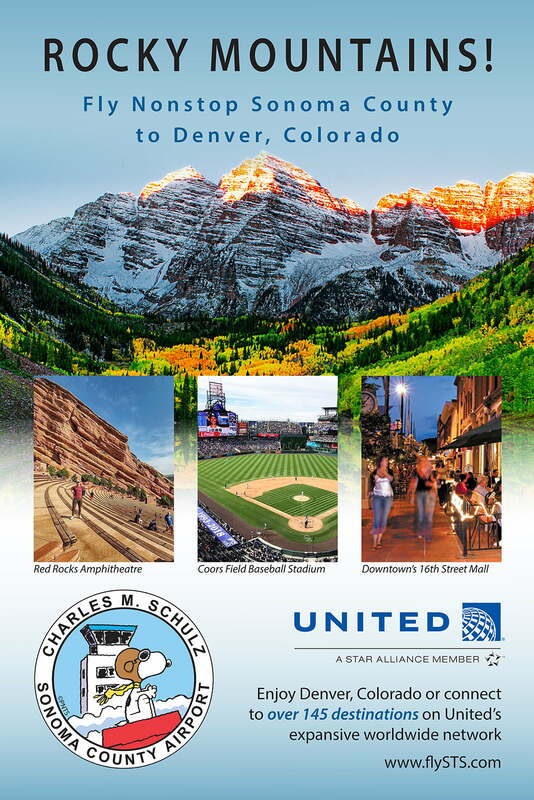 Denver and Sonoma County are popular tourism and business destinations, and Denver is a major United hub where STS travelers can connect to over 145 destinations on United Airline’s expansive worldwide network. Tickets for these daily flights are available for purchase at http://www.united.com. “These Denver flights into Sonoma County are the result of many years of effort by multiple partners toward the goal of service to a midcontinent hub. Through Denver, the Midwest and East Coast are just one stop away from STS. Cheers to a job well done, and to a flight that I personally have looked forward to!” Fourth District Supervisor James Gore said. Media that would like to attend the event should contact STS Marketing Specialist Gina Stocker at Gina.Stocker@sonoma-county.org or call (707) 565-7241 by Thursday, March 7 at 5 p.m. to arrange airfield attendance. Located in the heart of Northern California’s world-renowned Wine Country, STS is the only airport that offers scheduled air service into the North Bay region. Daily nonstop flights include: Alaska Airlines to Los Angeles, Orange County, San Diego, Portland, and Seattle; American Airlines to Dallas (2019), Los Angeles (2019), and Phoenix Sky Harbor; seasonal flights on Sun Country Airlines to Minnesota and Las Vegas, and United Airlines to Denver and San Francisco. All Airlines offer a wide range of connecting flights to destinations in the continental U.S., Mexico, and beyond. The Airport features six on-site rental car agencies, convenient ground transportation, easy and affordable parking with electric vehicle (EV) charging stations, the on-site Sky Lounge Steakhouse & Sushi Bar, and much more. For further information, journalists are asked to contact Airport Manager Jon Stout at jon.stout@sonoma-county.org or (707) 565-7243. For additional airport information, follow Charles M. Schulz – Sonoma County Airport on Facebook and Twitter.